The Art of Tuvalu has traditionally been expressed in the design of clothing and traditional handicrafts such as the decoration of mats and fans. Tuvaluan clothing was traditionally made from Fala leaves (Screw Pine or Pandanus). The material culture of Tuvalu uses traditional design elements in artifacts used in everyday life such as the design of canoes and fish hooks made from traditional materials. The design of women's skirts (titi) and tops (teuga saka), that are used in performances of the traditional dance songs of Tuvalu, represents contemporary Tuvaluan art and design. The collection of the Museum of New Zealand holds Tuvaluan artifacts and handicraft, including a man's jacket and a Mother Hubbard dress[Note 1] made from pandanus leaves that were made following the impact of Christian missionaries who demanded that the women of Tuvalu adopt more conservative clothing as compared to traditional Tuvaluan clothing. A traditional skirt made of Futu (Barringtonia asiatica) leaves from Nanumea atoll. The women of Tuvalu use cowrie and other shells in traditional handicrafts decoration of mats, fans and wall hangings that use dyed fibres woven in traditional designs. Crochet (kolose) is one of the art forms practiced by Tuvaluan women. A traditional headband (fau o aliki) or headdress (kula, pale) made out of pandanus, such as those prepared for the inauguration of a chief (aliki) would follow a specific design and the task of creating the headband or headdress is often reserved to a specific person, such as a daughter of the chief. The traditional floral garland of a young woman (Te fou ote tamafine) or a headdress for a woman (fou) would also follow a specific design using tiale (gardenia), pua (guettarda speciosa) and melia (frangipani). Te titi tao is a traditional skirt placed upon another skirt - a titi kaulama - and tops (teuga saka), headbands, armbands, and wristbands continue to be used in performances of the tradition dance music of Tuvalu, such as the fatele. The fatele, in its modern form, is performed at community events and to celebrate leaders and other prominent individuals, such as the visit of the Duke and Duchess of Cambridge in September 2012. Contemporary dancing skirts (titi) and tops (teuga saka) may still incorporate pandanus leaves, as well as synthetic or natural cloth that is decorated with bold geometric motifs and bold colours. Tuvaluan men also participate in performances of the traditional music in the costumes that follow tradition style that are made from pandanus leaves and synthetic or natural cloth that incorporate bold colours. Marriage ceremonies are usually conducted with men and women in traditional costumes. In 1960–1961 Gerd Koch a German anthropologist, visited the atolls of Nanumaga, Nukufetau and Niutao, which resulted in his publication of a book on the material culture of the Ellice Islands, which described, with illustrations, the design of traditional handicrafts and artifacts. Following the change of name to Tuvalu, the English translation by Guy Slatter was published under the title The Material Culture of Tuvalu. Charles Hedley, a naturalist at the Australian Museum, had earlier written the General Account of the Atoll of Funafuti (1896) which described some uses of the native plants and trees on Funafuti. The churches and community buildings that used for wedding celebrations and community activities (the falekaupule or maneapa) are decorated by the community with the exterior painted with white paint that is known as lase, which is made by burning a large amount of dead coral with firewood. The whitish powder that is the result is mixed with water and painted on the buildings. Artists with Tuvaluan ancestry in migrant communities, such as the Tuvaluan community in Auckland, New Zealand, produce work using traditional techniques and media and also using modern materials and contemporary Polynesian graphic designs. In 2015 an exhibition of the art of Tuvalu was held on Funafuti, with works that addressed climate change through the eyes of artists and the display of Kope ote olaga (possessions of life), which was a display of the various artefacts of Tuvalu culture. Lakiloko Keakea was born on Nui, Tuvalu, who now lives in New Zealand. Keakea learnt the practise of 'kolose' (crochet) and began making dresses and 'tiputa' (crochet tops). Keakea became active in Fakapotopotoga Fafine Tuvalu, an art group that taught and promoted the art practices of women from the various islands of Tuvalu. she travelled with the group to the Marshall Islands and learn the techniques of making 'fafetu', a star-shaped woven design. She is a member of Fafine Niutao I Aotearoa – the Tuvalu Women’s arts collective. Selina Tusitala Marsh, of Sāmoan, Tuvaluan, English and French descent, is a published poet. She represented Tuvalu at the London Olympics Poetry Parnassus event in 2012. Vincent Huang (黃瑞芳), a Taiwanese artist, constructed an installation on the reef of Funafuti in 2010 that was designed to raise awareness of the effect of climate change in Tuvalu. He was invited to create the Tuvalu Pavilion at the 2013 Venice Biennale. In 2014 he had an exhibition at the Museum of Contemporary Art, Taipei that invited visitors to consider the moral threat climate change presents to Tuvalu. Huang was invited to represent Tuvalu at the 2015 Venice Biennale. He created a turquoise pool crossed by two black walkways. The weight of the people on the walkways results in the pathways sinking into the water causing 'flooding' that symbolically reproduces the impact of global warming on Tuvalu. 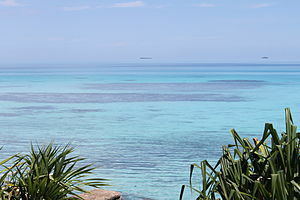 Huang selected the PVC lining of the pool to reproduce the colour of the "beautiful crystal blue of the Tuvalu lagoon". Lambert, Sylvester M. "Women dancers in Tuvalu". Special Collections & Archives, UC San Diego. Retrieved 25 January 2017. Wikimedia Commons has media related to People of Tuvalu. ^ pandanus jacket (FE001055/1) and Mother Hubbard dress (FE001055/2) Catalogue of the Museum of New Zealand (Te Papa). ^ Hedley, Charles (1896). General account of the Atoll of Funafuti (PDF). Australian Museum Memoir 3(2): 1–72. pp. 40–41. ^ a b Mallon, Sean (2 October 2013). "Wearable art: Tuvalu style". Museum of New Zealand (Te Papa) blog. Retrieved 10 April 2014. ^ "Te Papa - Collection". Museum of New Zealand. Retrieved 10 April 2014. ^ "Topic: Tales from Te Papa Episode 48: Tuvalu Clothes". Te Papa (Museum of New Zealand) Pacific Cultures collection video. Retrieved 10 April 2014. ^ "Kolose: The art of Tuvalu crochet" (PDF). aucklandcouncil. March 2015. Retrieved 12 July 2015. ^ a b Gerd Koch (translated by Guy Slater) (1981). The Material Culture of Tuvalu. Suva: University of the South Pacific. pp. 100–102. ASIN B0000EE805. ^ a b c d Takemoto, Shoko (4 November 2015). "The Art of Tuvalu - Climate Change through the eyes of artists in Tuvalu". exposure.co. Retrieved 23 December 2015. ^ Linkels, Ad. The Real Music of Paradise. Rough Guides, Broughton, Simon and Ellingham, Mark with McConnachie, James and Duane, Orla (Ed.). p. 221. ISBN 1-85828-636-0. ^ Murphy, Victoria (September 18, 2012). "Game of thrones: Duke and Duchess of Cambridge play king and queen before dancing the night away in Tuvalu". Mirror Online Edition. London. Retrieved October 21, 2012. ^ English, Rebecca (September 18, 2012). "Swaying to the South Pacific beat: Duke and Duchess of Cambridge don grass skirts to join in tribal dance on final leg of royal tour". Mail Online Edition. London. Retrieved October 21, 2012. ^ Gerd Koch (translated by Guy Slater) (1981). The Material Culture of Tuvalu. Suva: University of the South Pacific. ASIN B0000EE805. ^ Hedley, Charles (1896). General account of the Atoll of Funafuti (PDF). Australian Museum Memoir 3(2): 1–72. ^ Peter Bennetts & Tony Wheeler (2001). Time & Tide: The Islands of Tuvalu. Lonely Planet. ISBN 1-86450-342-4. ^ Goldsmith, Michael. (1985). Transformations of the Meeting-House in Tuvalu. In Antony Hooper and Judith Huntsman, eds., ‘Transformations of Polynesian Culture’ Polynesian Society. ^ Panapa, Tufoua (2012). "Ethnographic Research on Meanings and Practices of Health in Tuvalu: A Community Report" (PDF). Report to the Tuvaluan Ministries of Health and Education: Ph D Candidate Centre for Development Studies – "Transnational Pacific Health through the Lens of Tuberculosis" Research Group. Department of Anthropology, The University of Auckland, N.Z. pp. 39–41. Archived from the original (PDF) on 3 October 2013. Retrieved 16 March 2013. ^ Ron Brownson; Kolokesa Mahina-Tuai; Albert L Refiti; Ema Tavola; Nina Tonga (2012). Home AKL: Artists of Pacific Heritage in Auckland. Auckland Art Gallery. ISBN 978-0-86463-290-6. ^ a b "Interwoven Tuvaluan identity". New Zealand Ministry for the Pacific Peoples. 4 October 2018. Retrieved 6 April 2019. ^ "Lakiloko Keakea". Auckland Art Gallery. Retrieved 17 November 2017. ^ "Tuvalu's Lakiloko Keakea wins Pacific Heritage Arts Award". Pacific Guardians. 24 October 2017. Retrieved 17 November 2017. ^ Selina Tusitala Marsh (2012). Dark Sparring: Poems. Auckland University Press. ISBN 978 1 86940 786 5. ^ "Taiwanese artist fights for future of Tuvalu". Taipei Times. 3 August 2010. Retrieved 10 April 2014. ^ "Tuvalu Pavilion at the 2013 Venice Biennale". 2013. Retrieved 10 April 2014. ^ Walter, David (31 January 2014). "Tiny Tuvalu Gets the Eco-Art Treatment". Wall Street Journal: Arts & Culture blog. Retrieved 10 April 2014. ^ "Taiwan artist to highlight Tuvalu dilemma at Venice Biennale". Focus Taiwan News Channel. 9 March 2015. Retrieved 10 March 2015. ^ a b Lawson, Jane (19 September 2015). "Spotlight: Tuvalu Pavillion, La Biennale di Venezia". Corridor8. Retrieved 5 January 2016. ^ "One million people expected at Tuvalu's Venice Biennale pavilion". Radio New Zealand International. 11 May 2015. Retrieved 11 May 2015. ^ Mitzman, Dany (11 May 2015). "Getting wet feet for Tuvalu". BB News - Magazine. Retrieved 6 May 2015.